Today's music is a real treat! 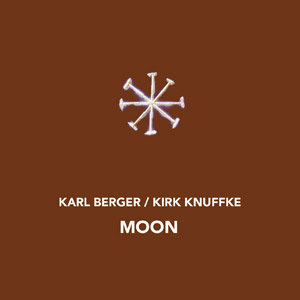 It is a two-CD duet between Karl Berger and Kirk Knuffke. It is entitled Moon (NoBusiness NBCD 76-77). On it we get 16 numbers composed by Karl, Kirk or both, with extensive improvisations. Knuffke is that rapidly rising cornet firebrand who has graced quite a few sessions of late, a player of classic poise and excellent ideas. Berger is a living monument, a vibraphonist among the very best, a beautiful force for avant jazz, new thing, or whatever you want to call it since the '60s and his seminal recordings on his own and with Don Cherry. He also is the founder of the all-important Creative Music Studio, leader of a very fine big band, pianist of thoughtful demeanor and composer of great strength. OK, all that considered you would expect this two-CD set to be something fine. And it is. There is a strong connection in place between the two throughout. Karl sounds just fabulous. And he even plays some melodica here, happily. Kirk gets a chance to interact with Karl in ways that show an introspective, intimate side of his playing we don't hear as much of in the larger ensemble performances. The compositions are anything from "blowing" structures to full-blown, more or less through-composed gems. They combine with the improvisatory brilliance of the two in especially good form to make a recording that breathes with true life. I do not need to break the music down into little bits. You can do that as you listen. The fact is, though, that the music hangs together so well as a whole that the experience is in that way holistic. It is exceptionally there at nearly every moment. It is a voyage from disk to ears that puts you in a special place, the sort of thing only two masters of the improvisatory arts can give you and that on especially good days. I cannot recommend this album more heartily. It is a strong part of our now fading year, certainly.